The Celtic Pearl Pendant is a beautiful example of modern Celtic jewelry. The teardrop style pendant starts with a Swarovski® crystal encrusted Trinity knot and ends with a luminous pearl. 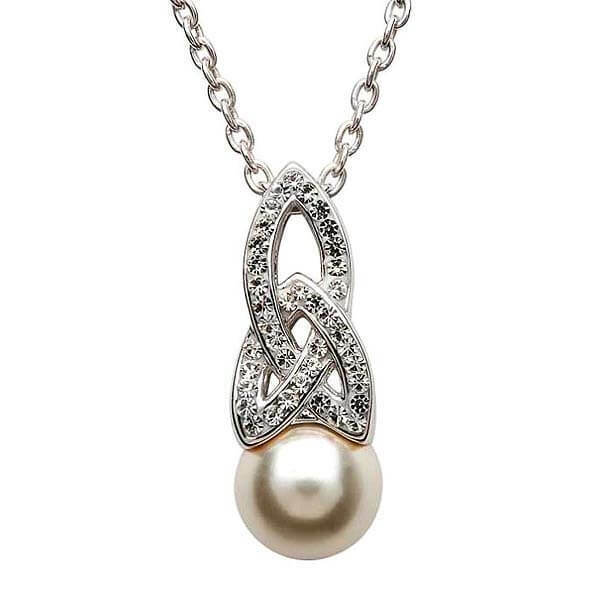 The Celtic Pearl Pendant is the perfect bridal accessory. Handcrafted in Ireland and hallmarked by the Dublin Assay Office. Service rating : All excellent. Web page is very interesting, there are historical and cultural comments about the jewellery. Also I find the page very democratic because you may choose from what you need, from just design or a more spiritual background behind a piece or the the fact to be able to choose from the point of view of the cost of the piece. There is an excellent equilibrium between price and quality. Also the page is clear and elegant (most pages I find they are as online supermarkets and don't like that). Free cost delivery is a great plus and was fast and accurate. Customer personal attention was excellent. The piece I bought is beautiful in the photo, the real one is much more beautiful. I will buy again. Product : Beautiful piece. Beautiful made. Beautiful pearl, so delicate and has got a very sweet but strong colour. 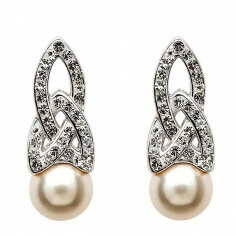 The design is what most appealled to me, the triqueta with the pearl and also I love swarovski crystals. It has got a beautiful sparkling in the sun light, not only because of the crystals but because of the sterling and the pearl.